One misconception that many dads involved in child custody cases may have is in thinking that they do not have rights to child visitation if they are not listed on the birth certificate. This mistaken belief has left many fathers thinking that they will never have a chance to have a relationship with their children. In Florida, when two unmarried parents have a child the mother is viewed by the law as the sole parental responsibility parent until the father steps up and files a child custody case to have his parental rights given to him by the court. These rights include; shared parental responsibility, shared decision making authority, access to school and medical records, a set time-sharing schedule dictating what days the child will spend with which parent, and the ability for dad to have a say in whether or not the mother can move out of state with the child. Whether or not a father is actually listed on a birth certificate has very little bearing on his ability to spend time with his child. The biggest thing for dads to remember is that they will need to speak to an attorney about filing a men’s rights custody case with the court and litigating it to resolution. These cases are referred to as petitions to establish paternity. Once the petition to establish paternity is filed with the court some of the factors that the judge will consider will be the historical involvement that the father has had in the child’s life, efforts that the father has made to spend time with the child, and to a much lesser degree any child support payments made, whether they were court ordered or voluntary, the father had made prior to filing. It is very important that a father going into a child custody case be able to clearly show that he has made reasonable attempts to communicate with and spend time with the child. 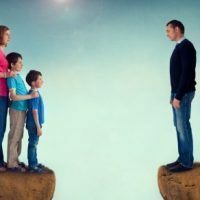 One of the most common defense is that the opposing party will assert men’s rights cases will be that the father made little or no effort to be bonded with the child and that the father’s filing for time-sharing is motivated by some other purpose such as the state going after the dad for child support. Very often, young first time fathers are manipulated or intimidated by the other parent who tells them that they have no rights to their child and never will. Very often the other parent will back up these claims by pointing out that dad is not on the child’s birth certificate. Such claims are completely inaccurate as child custody courts want to make sure that the children have a bond with both parents including the father. In fact courts have recently taken child custody and fathers rights cases a step further and have begun to adopt the believe that a child having a bond with the father is just as important as a child having a bond with the mother. This goes against the old-school mentality that the mother was the most important parent for the child to be bonded to. In this modern day and age the courts see Fathers rights to children as being every bit as important and valuable to a child’s development as the rights of the other Parent. This is great news for men’s rights lawyers who advocate for the rights of fathers to be bonded and have a relationship with their children.